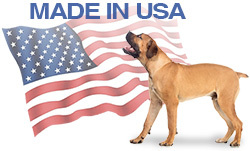 The topic of antihistamines for dogs pops up fairly often around here. Its a valid question since antihistamines may help quell itching and definitely play an important role in any campaign to ward off Demodex outbreaks triggered by allergies. Antihistamines might not be safe for nursing mothers or puppies. If your dog is either, ask your vet first. Make sure the antihistamine is the ONLY active ingredient listed on the label. Avoid combination and multi-purpose medications as these often contain other ingredients that are not safe for dogs. Also avoid products that contain alcohol, sodium or xylitol. Do not use time-release formulas. Antihistamines tend to be more effective when the dog is taking Omega 3 fatty acid supplements. Test for reactions first. Instead of giving your dog a full dose right off the bat, dose with a small amount and wait a few hours. Watch your dog for any signs of side effects or reactions. If one type of antihistamine doesn’t work after 7 days, then try a different one. Dogs respond differently to different types of antihistamines and one may work when another does not. Dosages are not comparable with human doses. 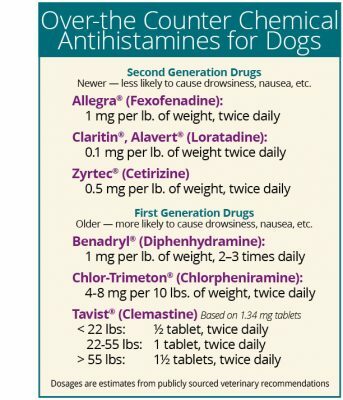 Dogs need higher amounts as they do not absorb or metabolize antihistamines like we do. Most antihistamines are relatively benign, so it should have no deleterious effect on your pet. 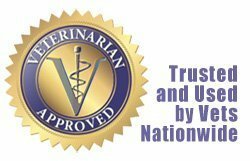 A licensed vet should be consulted before starting any new drug regimen, especially if the dog is already taking other medications or has other medical conditions. Drugs can interact with other medications, producing adverse side effects that can be serious. Some drugs can also worsen a medical condition. 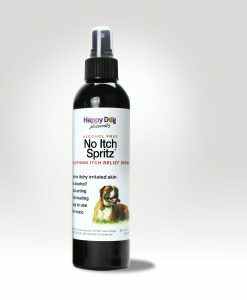 No Itch Spritz natural itch relief for dogs – alcohol-free! Removes dander flakes and excess hair that add to the mites food supply. 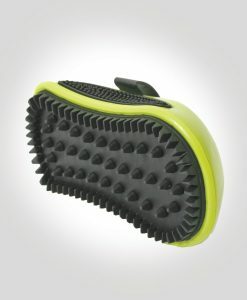 Promotes hair regrowth better than other brushes. This entry was posted in Cheyletiella Mange, Demodectic Mange, Immune Support, Mange Tips & Tricks, Sarcoptic Mange, Skin & Coat. Bookmark the permalink.